This 25 Foot Cable Comes with Connectorized Ready-made Ends and Features Black or White UV Resistant PVC Jacket over Two layers of Bonded Foil and One Layer of 77% Braid, Bonded Foam Dialectric with a Copper Clad Steel Center Conductor. You can use this jumper to connect that new Splitter HDTV, Antenna, Outlet Jack, and Even Satellite Dish! Use transition Connector/Adapters for conversion to RCA and BNC Connections with Baseband, RF and Video! Perfect for HDTV, DTV, Cable TV, Master Antenna and Satellite Master antenna Applications with 2.2 GHz Bandwidth. This Cable comes in Black or White and is UV Resistant for Installation Inside and Outside of your Home or Office. 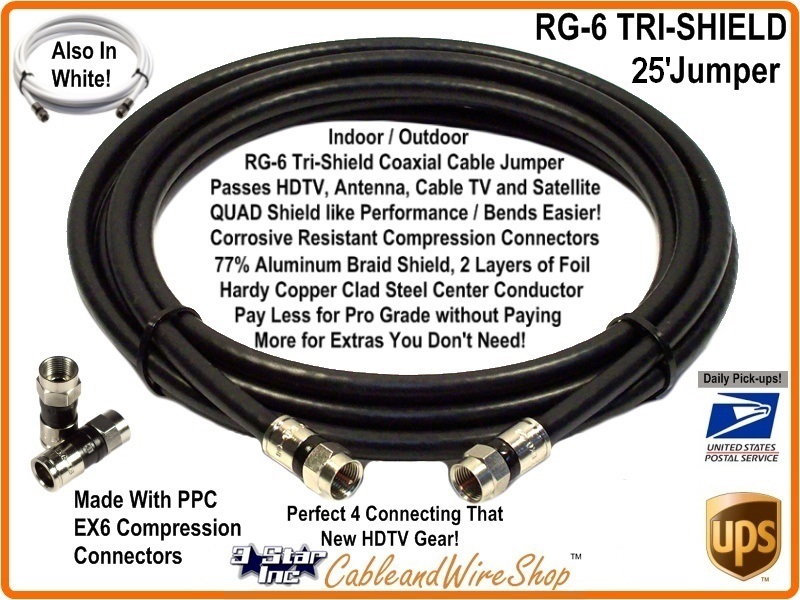 Note: Tri-Shield - Based on a Standard cable construction of fully bonded foil with a layer of shielding braid, Tri-Shield adds an additional surrounding layer of foil to improve transmission reliability by means of an additional interference barrier. The industry standard workhorse, it provides ample conductance for most drop applications up to 150 feet in length. This cable Features like Quad Shield Performance in a more pliable form for Ease in Installation and Maintenance.